This exhibition will explore the remarkable transformation of Camille Pissarro's landscape paintings over the course of an important decade in his career, from 1864 to 1874. During this time, he moved from being a student of the Barbizon school to becoming one of the leaders of the emerging Impressionist movement. This critical period of his evolution as an artist laid the groundwork for an entire generation of painters, many of whom were influenced by his experimental techniques and vision. The exhibition will include approximately 50 paintings, ranging from his Salon compositions from the 1860s to a selection of his entries for the first Impressionist exhibition in 1874. 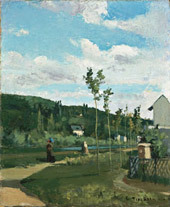 Through these canvases, visitors will be able to see the development of Pissarro's painting technique, palette, and subject matter during a brief, yet intense period of his long and fruitful career. After its stay at the Milwaukee Art Museum, the exhibition will then move to the Memphis Brooks Museum of Art. Generous additional support provided by the Richard and Ethel Herzfeld Foundation, Friends of Art, Fox 6, Einhorn Family Foundation, Milwaukee Journal Sentinel, Wisconsin Department of Tourism, R.D. Peters Foundation, Ruth St. John & John Dunham West Foundation, Florence Gould Foundation, an indemnity from the Federal Council on the Arts and the Humanities, and the National Endowment for the Arts. This exhibition is organized and circulated by The Baltimore Museum of Art.